I have a Windows-user habits even if I use Linux now. One of them is sorting files by type and show them in groups in file manager. 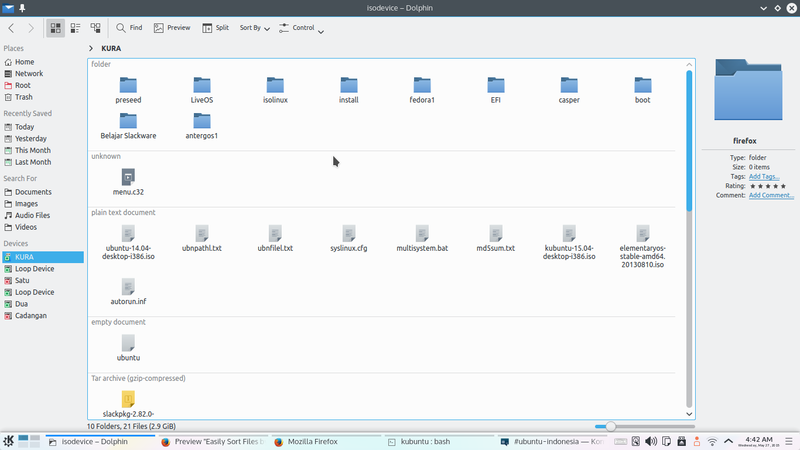 The file manager I know capable for it is Dolphin. Dolphin is KDE file manager. 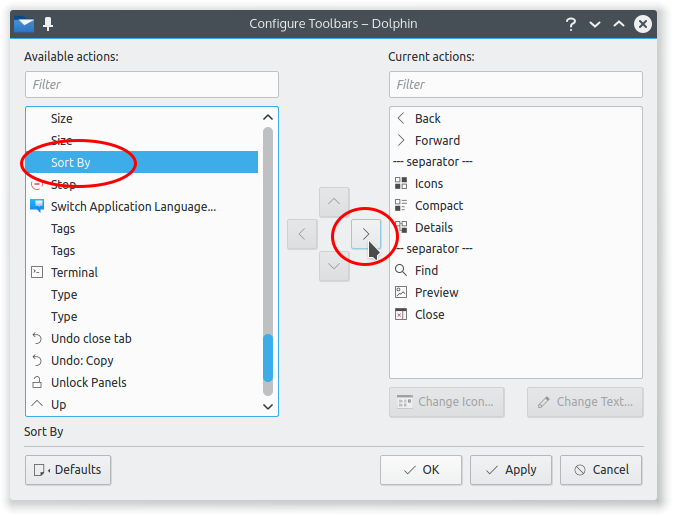 It is included by default in Kubuntu. I will show you how to achieve it easily and how to change by a single click. Actually, you can do sorting by a standard way (see point 2 below). But to make it easier, I usually create a menu once and use it all the time. 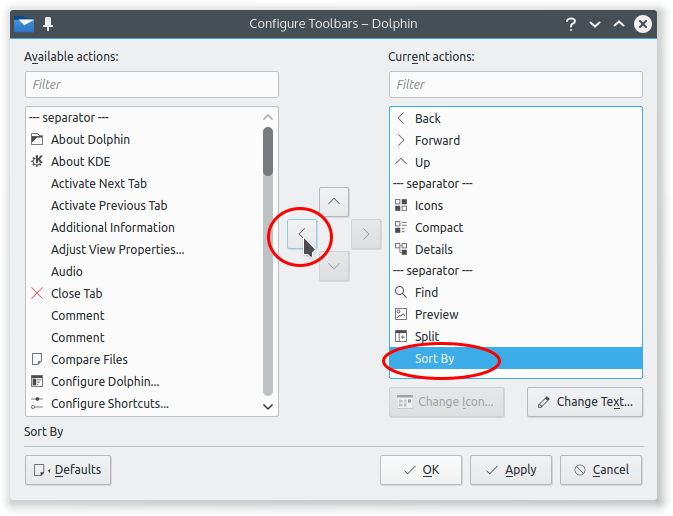 Right-click on the toolbar > Configure Toolbars. Choose Sort By > click ">" (right arrow) button > so Sort By item moved to right panel > OK. See picture below. Now you get a new menu named Sort By in toolbar. 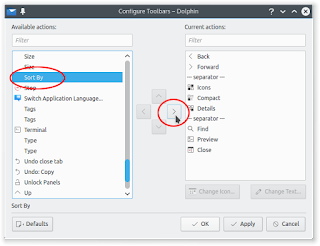 Open Dolphin Menu Button > check Show in Groups. 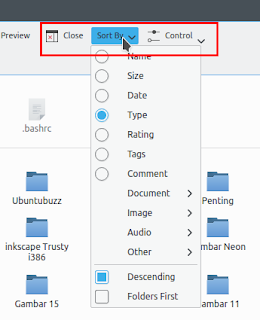 To sort by type: open Sort By menu > select Type > check Descending. To sort by date: open Sort By menu > select Date > check Descending. Now you can change the view by clicking new menu button Sort By. The normal sorting usually is by clicking Control menu button > Sort By > choose one mode. You can do grouping by clicking Control menu button > Show in Groups. But once you make a custom menu like above, Sort By entry in Control menu will disappear. It moved to the toolbar. 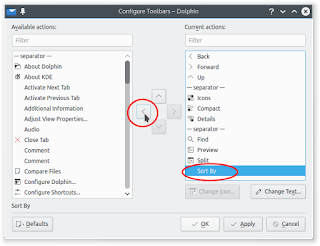 If you dislike the Sort By button in toolbar, you can turn it to the default by clicking toolbar > Configure Toolbars > select Sort By entry in right panel > click "<" (left arrow) > so Sort By entry moved back to its position > OK.